Hex buffer/driver IC with high-voltage open-collector outputs. 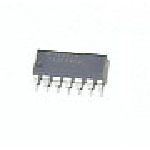 As used in display driver circuitry in many solid-state games and special solenoid circuitry in Bally/Williams System 11 games. Use with 14-pin chip socket. All sales are final on electronic parts- no returns. WILLIAMS: Grand Lizard, High Speed, Road Kings, more?